For Stonewares like M340, M325, M390, M350. This is an industrial tableware glaze recommended by tech support at Fusion Frits. It not only fires hard and crystal clear but has outstanding suspension and application properties. In addition, it works well with most stains. The magic for the way this glaze fires and its hardness and durability lie in the variety of fluxes in contains and the very low boron content coupled with high SiO2 and Al2O3. The fluxes most likely to create micro-bubbles at this temperature are sourced in a frit. It has the traditional CaO and KNaO, but the talc adds MgO and the frit adds SrO plus a tiny bit of BaO. This mixed-oxide effect produces a very well melting glaze yet having excellent body (considering it has only 18% of a low-boron frit). 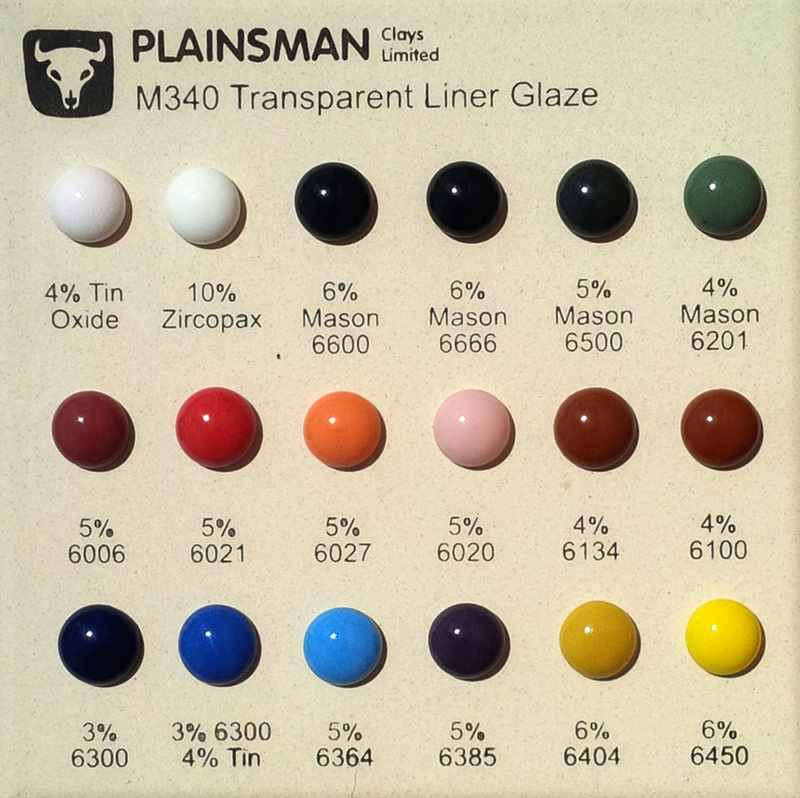 G2916F stoneware clear glaze sample board with added Mason stains. Sample are porcelain. Button melted samples of various stains in cone 6 stoneware clear glaze. It is standard practice to fire cone 6 using a hold (or soak) at top temperature schedule (e.g. for 30 minutes) to produce a defect-free glaze. However we recommend a drop-and-hold firing schedule (like PLC6DS). Both require manual programming of your kiln (because none of the built-in programs do any kind of hold). 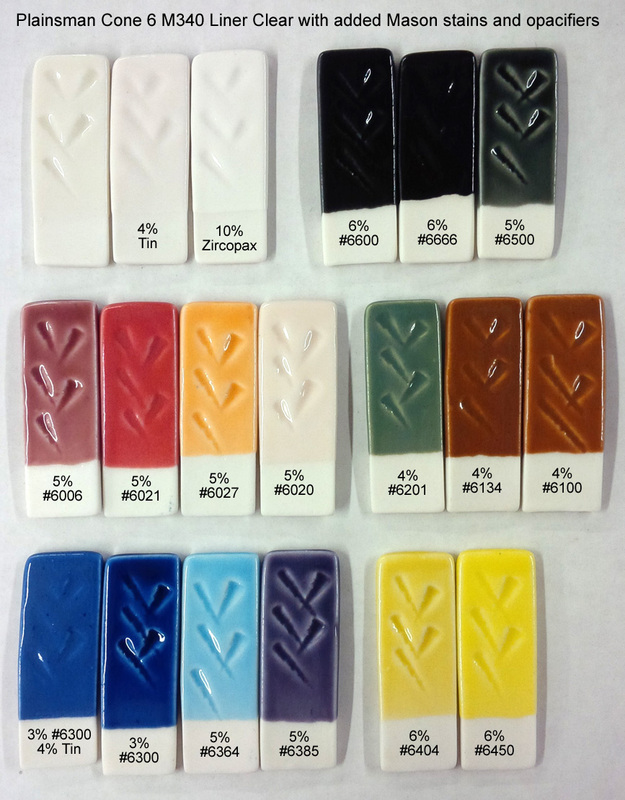 If you have not manually programmed your kiln, this is a barrier you need to cross to produce more defect-free glaze surfaces. The recipe of this glaze is not proprietary. We developed it and sell it premixed but you can batch it (or even adjust it) yourself. For detailed technical information check its page, G2916F, at the Digitalfire Reference Library. Adding the Stains and Opacifiers: Simply multiply the weight of the amount of powder you want to use and divide by 100. For example, if you have 2000 grams of glaze powder and want to add 6% stain: 2000*6/100=120 grams of stain. Or, 10% zircopax: 2000*10/100=200 grams of zircopax (stain %'s are suggestions, for some colors you may need more, testing is needed). Bright colors and whites will be muted on dark-burning bodies. For darker firing bodies like M390, we recommend using the GA6A base Alberta Slip glaze. For a one-coat dipping glaze we recommend a specific gravity of 1.5 (to get that divide the total weight of powder by 1.08 to determine the amount of water). Yield is about 1.2 litres per kg of dry powder. To prepare it for use as a single layer dipping glaze, add the powder to 90% of the water and mix until it flows well. Then adjust the amount of water to get the right specific gravity (more water to lower it). If needed, adjust the viscosity to prepare for sieving through 80 mesh. If the slurry is thin, there is a danger of it settling out while sieving, so it must be gelled. To do that add enough flocculant (vinegar, epsom salts) so that the slurry mass stops motion in about 5 seconds after mixing or stirring is ceased. Flocculants are powerful, only a few drops of vinegar (or pinches of crushed epsom salts) per gallon are needed. After sieving do a final viscosity adjustment to make the slurry thixotropic (thixotropic liquids gel after motion stops). You can "see" the slurry thixotropy by noting a "bounce-back" on final stop-motion after stirring. Add enough flocculant to get stop-motion in around 2 seconds (in a 1-2 gallon bucket). As before, be careful in adding the flocculant, it is easy to add too much and get a bucket of jelly (if that happens add (by the drop) Darvan to re-thin it). When the slurry is right, you can two-second-dip a piece and on withdrawal it will drain well, gel quickly, only a few drips will fall and on turn-over the glaze will not run back down. It will apply in an even layer on dense or porous bisque. This "rheological state" of the glaze slurry can change on storage so be ready to adjust it later. Recheck the specific gravity from time to time and, if needed, adjust by adding or removing water. As you gain confidence with doing this you will be able to create a thixotropic slurry at a range of specific gravities. Our recommended specific gravity is based on how much water is needed to get the undeflocculated glaze to a state where it needs about 2 grams of epsom salts per gallon to gel. This can also be mixed as a brushing glaze or a first-coat dipping glaze.